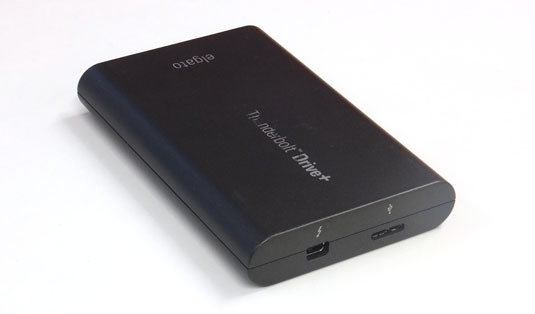 Elgato’s previous offering was, to be fair, a touch lack luster relying on a USB 2 based SSD. Seeing as Thunderbolt can push data through at 10Gbps and Sata 2 manages a theoretical throughput of 300 MB/s. So you really aren’t going to stretch out those Thunderbolt muscles before reaching the limitations of Sata 2. In the New Thunderbolt Drive+ you get USB 3,0 upping data rates to 6 Gbit/s or 600 MB/s. This unit really is aimed at being for storage only and no other fripperies as there’s no second Thunderbolt port to use for daisy chaining but that’s going to have to be the sacrafice made for not having to lug around another power supply. The SSD comes formatted as HFS+ ready for mac users but if you want to use this with Windows then it’s a case of having to format to NTFS and then use Paragon Software’s NTFS for Mac OS X to enable read and write on a Mac. As it stands you can read from any NTFS drive and if you have Mountain Lion here’s how you enable NTFS natively albeit non supported way. 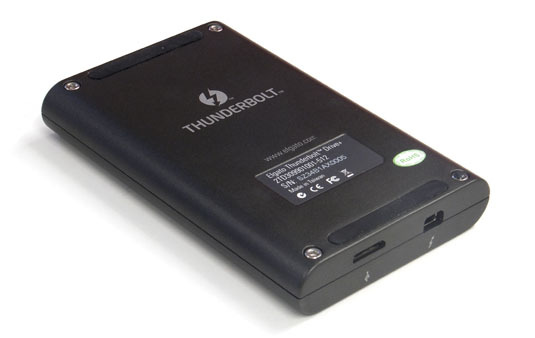 At a first glance this doesn’t look like little more than your standard Thunderbolt Enclosure but cracking open the unit does reveal some customisations that stand out from the off the shelf parts used. Inside the Thunderbolt Drive+ houses a “server grade” Plextor PX-512M5Pro SSD with the bods at Elgato claiming transfer speeds of “up to 420MB/s”. Along with a Marvell 88SS9187 and Intel DSL2210 Thunderbolt controller single chip which explains the lack of any Thunderbolt throughput yet still being Thunderbolt powered. The tweaked firmware purportedly contains such magic as “Global Wear Leveling” which is a fancy way of placing data equally across the drive to ensure consistent use of memory cells throughout. Other not so obvious tweaks are to enable portable drive use without draining the computers batter too drastically. That Intel DSL2210 sips just 0.7W of power, infact it’s Intel Thunderbolt controller lowest powered Thunderbolt controller. The next step up comes in the shape of the Intel DSL3510L which is dual channel and supports daisy chaining but this comes in with a power cost of 2.8W. Sure we could grind through testing benchmarks and get the highest performance figures but they aren’t going to necessarily translate into real world usage so we’ve gone down a more traditional route. Using a combination of different sized ISO’s to test sustained transfer rates. All tests were done on our trusty 2012 Macbook Pro that’s kitted out with it’s own internal SSD. A 4.7GB DVD ISO copied across in 13 seconds and a 10GB iso image finished moving in only 28 seconds with transfer rates pretty much hitting the limits of that SSD 3 interface. Wanting to see how things fared with a more traditional HDD setup, out came the spare macbook (same specs) but this time with a HDD in situ. This time that 10GB disc image took 2 minutes at close to 100MB/s. Obviously, the 320GB HDD provided an bottleneck here. Bare thunderbolt enclosures are still very thin on the ground perhaps due to the cost and licensing needed for Thunderbolt. Chinese knockoffs aren’t available so you are limited to enclosure with HDD bundles and that goes some way to explaining a relatively high price. Yet with that being said it does deliver speed and extra storage that will come in handy for those with enough disposable income. The Elgato Thunderbolt Drive+ Portable SSD makes full use of available bandwidth only being limited by the SSD speed. Being bus powered is a boon as no one likes carrying around yet another PSU. If you have the money to spare it’s a no brainer, if you’re looking to eek out more storage other options do exist but always with trade off.